Survivorship bias should not be overlooked, in my opinion it is the single greatest fallacy in investing. It revolves around the tendency for failed companies to be excluded from performance studies due to the fact that they no longer exist. Survivorship bias causes the results of studies to skew higher because only companies which were successful enough to survive until the end of the period are included. Similarly, mutual fund performance may be misleading due to Survivorship bias when underperforming funds are merged or discontinued. When we are pouring over the data to determine why a particular strategy (either backtested, or in a fund) outperformed over a specific time period...we are implicitly making an assumption...that this strategy is special. After all, almost all of the other strategies failed, why did this one win? There must be some special property it exploited. I believe this assumption is a logical fallacy. A Random Walk Down Wall Street has a relevant example. Take a large number of people, and ask them to flip a coin. If they flip heads they win, tails and they're eliminated from the game. After the first flip, about half the people will be eliminated. Then ask them to flip again, and again, and again. After 10 flips, only a select few people will be left. Are these people "lucky"? Are they "skilled". Would anything be gained by spending time studying their coin flipping strategy? "The mentalist Derren Brown once predicted he could flip a coin 10 times in a row and have it come up heads every time. He then dazzled UK television audiences by doing exactly that, flipping the coin into a bowl with only one cutaway shot for flair. How did he do it? He filmed himself flipping coins for nine hours until he got the result he wanted. He then edited out all the failures and presented the single success." It is easy to fall victim to the Survivorship Bias. After any process that leaves behind survivors, the non-survivors are often destroyed or muted or removed from your view. If failures becomes invisible, then naturally you will pay more attention to successes. Not only do you fail to recognize that what is missing might have held important information, you fail to recognize that there is missing information at all. In other words, considering the large initial sample size, studying any one particular strategy, and trying to peel out the "why" behind its results, is an effort in futility. Studies have shown time and time again, that funds which outperform over a particular time period, show no increased likelihood of outperforming over the next time period. There was actually a slight negative correlation, implying a reversion to the mean was in play. In fact, the number of people/strategies/funds who beat the market, is statistically consistent with the number you would expect if the market were a game of random chance. This article should be required reading for any investor, as it highlights the mentality you need to be successful, and stay the course. You must remind yourself that when you start to pick apart winners and losers, successes and failures, the living and dead, that by paying attention to one side of that equation you are always neglecting the other. If you are thinking about opening a restaurant because there are so many successful restaurants in your hometown, you are ignoring the fact that only successful restaurants survive to become examples. Maybe on average 90 percent of restaurants in your city fail in the first year. You can’t see all those failures because when they fail they also disappear from view. I think the point is just passive investing and mimicking the benchmark is safer than going for active funds. Hopefully your funds are indexes. Hopefully your funds are indexes. I din don't know vanguard sold anything but. This is truly interesting, thanks for sharing. An interesting post, sure, but is there a reason for making it twice in two weeks? Vanguard also has active funds, and a lot of assets in those funds. They actually perform pretty well because... wait for it.... low fees. Its amazing, you strip away the fees and then an active fund actually stands a decent chance of doing well. Who would have thought? Oh, and Bogle started his career running one of those active funds; the Wellington fund. Wellington admiral shares are only 0.18% which is lower than some of Vanguard's index funds. It has also outperformed its benchmark going back to 2001 by an average of 1.5% a year. They actually have a couple with even better track records than that(VPMAX*), but do to high demand they are closed to new investors. Which brings up another point. Most successful active funds eventually fail because they get too big. The managers get paid based on the amount of assets so even when they get too big they still want more. They eventually run out of good ideas/deals to invest in so they start to invest in crap or replicate an index. Vanguard forces successful active funds to close before they reach that point. The sad thing about that cartoon is that is exactly how penny stock promoters work. When they say you can get 2000% returns based on their advice they got to that number by calling people and recommending a different penny stock each day to a different group of people. Over the course of the month you likely have 20 business days the market is open. 15 didn't move at all... no volume of course. 3 crashed and burned. 1 was up 10%. 1 was up 2000%. Now they call everyone they called on that particular day and say, "The last time I called you I recommended XYZ stock, since then it is up 2000%!!!!!!!! You are an idiot if you don't buy ABC right now! Do you want to be the guy who didn't buy ABC before it shot up 10,000,000,000%?" Ok... small exaggeration on my part. You get the idea. IBD: Do you still own shares in Vanguard Wellington Fund ? If so, aren't you a shareholder in an actively managed fund? Bogle: First, let me make one point clear. I own a lot because I started working at Wellington Management in 1951. We had a defined contribution pension plan, and 15% of my compensation went into that plan, which is entirely the Wellington Fund. I've been accumulating it for 60 years and I'm not about to stop. I've kept the original legacy position for two reasons. One, that was the fund I was brought up with. Two, its founder, Walter Morgan, gave me my job at Wellington. I owe it to him. IBD: It's not exactly a gonzo actively managed fund is it? 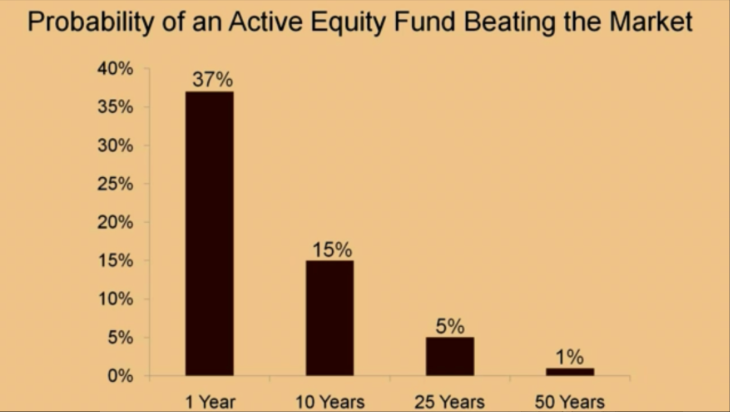 Bogle: The typical fund, 85% of its performance is determined by action of the stock market. In Wellington Fund's case, in the last decade 97% of its return has been determined by the return of the index I put together for them in 1978. It consists 35% of a corporate bond index fund, I think it's the Barclays Aggregate now. And 65% is the total stock market index fund. So 3% of its performance is due to active management. This is less than traitorous of me (regarding his advocacy of index investing). Basically, it's close to a balanced index fund. Dodge, you seem to have conveniently overlooked this observation (made by theoverlook, ironically enough). Duplicate threads, disappearing threads, what's going on here? 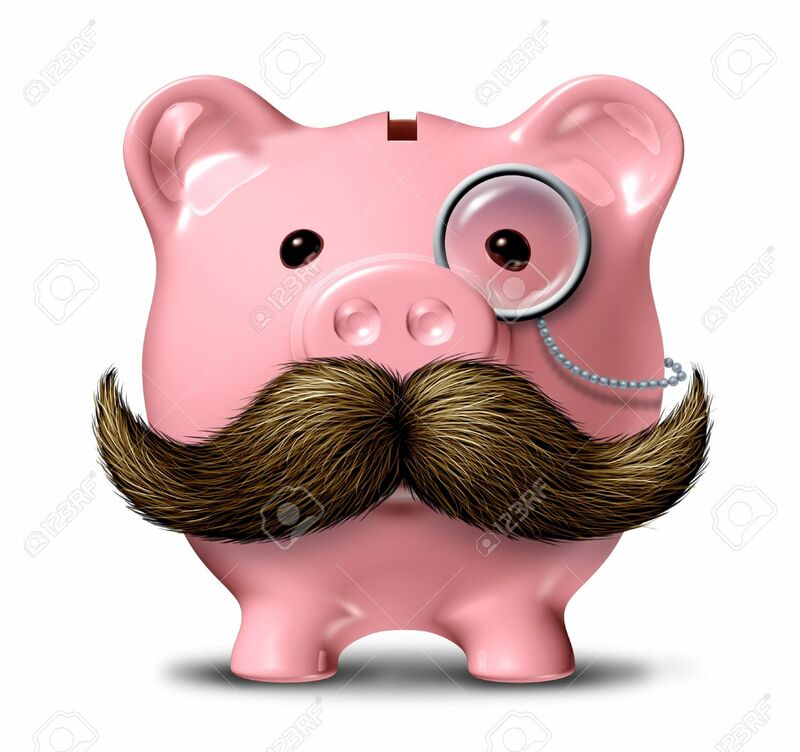 I feel like I'm in the Mr. Money Mustache Forum Twilight Zone. Survivorship bias - the single greatest excuse of the envious. Vanguard forces successful active funds to close before they reach that point. Acttually this isn't true. For many funds- they add more fund managers. Look at Vanguard Windsor, Vanguard Windsor II, Vanguard Global Equity. All good funds when they had one manager. The assets grew and more managers were added and performance has been not as good. Seriously, what is going on? Is this some kind of meta-experiment designed to illustrate the operation of survivorship bias? The survivorship bias thread that survives will, thanks to survivorship bias, be the one people focus on? Haha, that's a great idea! Wish I'd thought of it. The other thread was never going to stay on topic, so I remade the thread without the controversial charts. It is all about getting good data. No one can make good decisions when the data has been manipulated by the party that stands to gain the most. Along the idea that failures are often hidden, it is amazing how many failures are glossed over when the company is trying to convince you to work 80+ hours a week in the pursuit of "success". Everyone looks at and admires John Doe, EVP who has dedicated himself to the company for 30+ years and climbed the ladder. Never mind that he has been divorced twice and had to send his kids to rehab (or had to go himself). It would be quite an undertaking, but very interesting to see a non-biased study of career "success" in various fields taking into account outside (but not unrelated) factors such as financial stability, marriage satisfaction, parental involvement, etc. I'm reading The Black Swan and just got to this quote. I thought it sounded familiar! Truly an awesome chapter. See also: startups. Atlassian's IPO yesterday will help further fuel the fire for the next generation of failures that would have been better working for a company for 10 years then retiring.